A number of EM instruments transmit and detect electromagnetic energy and are classified by their transmitted frequency and type of transmission. Magnetic susceptibility, ground penetrating radar and metal detectors are types of EM instrument and are described in separate sections. There are other types of EM instrument which are known as conductivity meters that transmit a continuous EM signal. This signal generates or induces a secondary signal in sub-surface archaeological features which are electrically conductive. The secondary signal is detected and recorded by a receiver in the instrument. The instrument can therefore map variations in electrical conductivity that can be interpreted in terms of sub-surface archaeological features such as walls, ditches and pits. The hand held or sled-drawn instruments are designed for fast data collection and can be combined with a Global Positioning System (GPS). Some EM instruments can simultaneously measure electrical conductivity and magnetic susceptibility. The depth of investigation depends on the EM frequency or frequencies transmitted and the electrical conductivity of the sub-surface. 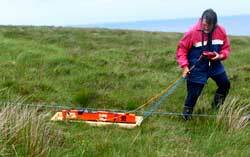 Typical instruments used in archaeological surveys have depths of investigation between 1 m and 4m.